Dakota Ridge is the Sunshine Coast's winter recreation area. Located on a 1,532 acre plateau with 15 kilometres of cross country ski trails (classic & skate) and 8 kilometres of snowshoe trails. It is a beautiful, subalpine setting and includes some old growth forest. Peaking out at approximately 1200 metres, you will be treated to some beautiful views of the Coast mountains, Vancouver Island and the Georgia Strait. Dakota is located at the end of Field Road in Wilson Creek on the Sunshine Coast. The main parking lot is located at the trailhead, 14 kilometres up the forest service road. The access road is plowed on a regular basis. Winter conditions should be expected on the road and access is restricted to four-wheel drive vehicles with chains. All terrain vehicles are not permitted in Dakota Ridge. There are several amenities available when you get to the Ridge. There is warming hut with fireplace and an ecologically sound outhouse. 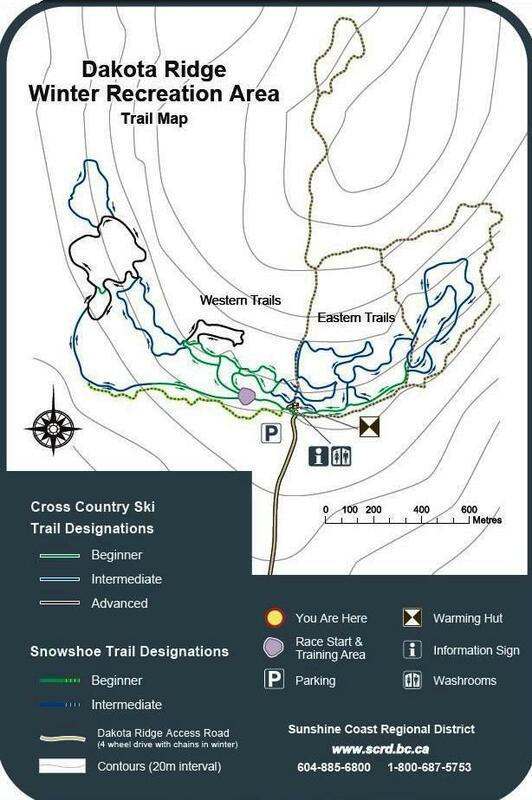 A trail map is located at the kiosk near the trailhead. On weekends the area is patrolled by volunteer trail hosts who answer questions, monitor trails, and help ensure skier safety. Because this is a wilderness area with varying weather conditions, visitors should be dressed and prepared for winter weather. No garbage facilities are available on site, so please pack your garbage out with you. Unfortunately, with the exception of one trail, dogs are not allowed on cross-country trails. Fees for the ski and snowshoe trails help to pay a portion of the cost of maintaining the trails, road and facilities. Season passes can be purchased at the Sechelt Aquatic Centre, 5500 Shorncliffe Avenue, Sechelt, or at the Gibsons & Area Community Centre, 700 Park Road, Gibsons. Day passes can be purchased at the above locations as well as at the trailhead once season begins (exact fee amount required), at Alpha Adventures and Straight Coffee in Wilson Creek, and at Source for Sports, Off The Edge, and Halfmoon Sea Kayaks Outfitters & Coastal Adventures in Sechelt. Click here to return from Dakota Ridge to the Sunshine Coast Trails Home page.